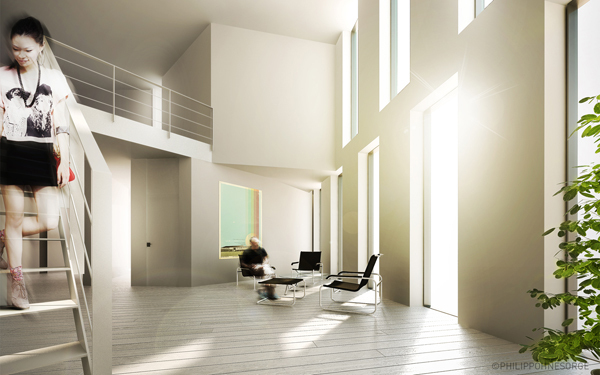 This is an innovative residential building designed by Philipp Ohnesorge in Vienna. The plot is situated between the 16th, the 17th and the 8th district in Vienna, next to one of the main traffic axis, the Guertel. It is in proximity to the city center with its historical buildings and attractions. The situation today is that the whole plot is empty and leaves a hole in the urban fabric. The block is not closed, the empty gap is now used for parking and is a waste of precious space within the city context. It has an outstanding value and must be reactivated. 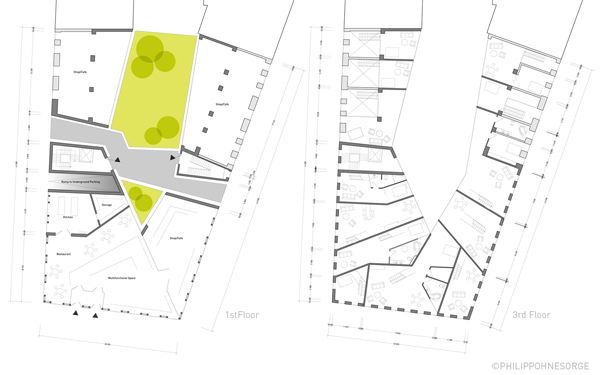 The first measure to be taken is the widening of the inner courtyard by slicing the existing buildings, to create a spacious yard that allows public use and increases daylight exposure to the apartments. 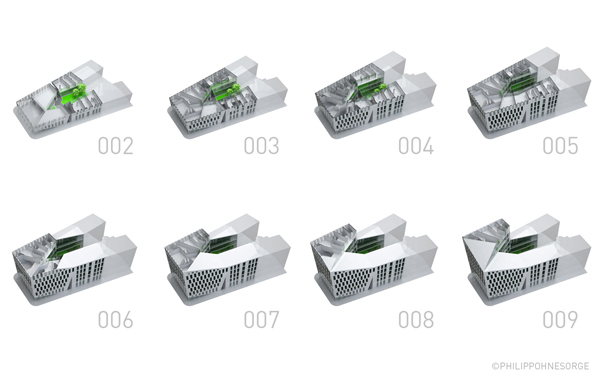 By expanding the given roof shape and twisting it around the center until reaching the maximum allowed building height, we created a volume that extends the given geometry and context with maximized usage of allowed building height. A gap between existing and new building mass allows access to the inner courtyard that also provides the entrances to the apartments. On the first two floors a public square will be created that invites the public to different activities such as eating, shopping, etc. It stimulates the exchange and communication between the residents and will give the area a more personal feel. The apartments are accessible through connecting hallways that are located on the northern facade. 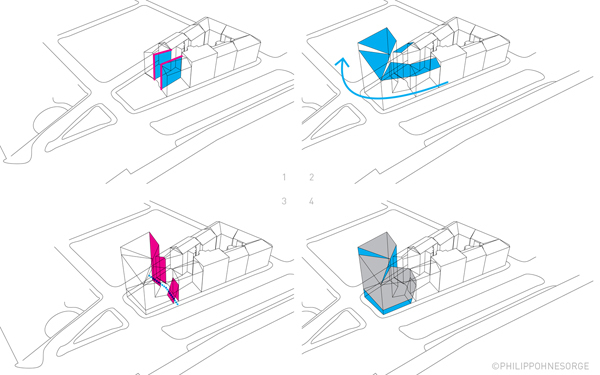 By this circulation method we provide maximum space for the apartments with a maximized exploitation to daylight. All apartments are duplex with partly double height rooms that create spacious, light flooded living spaces. The surrounding buildings are in average not higher than six stories, only on this plot a maximum building height of 41 meters is allowed. This provides the upper apartments with an extraordinary view over whole Vienna and even farther. 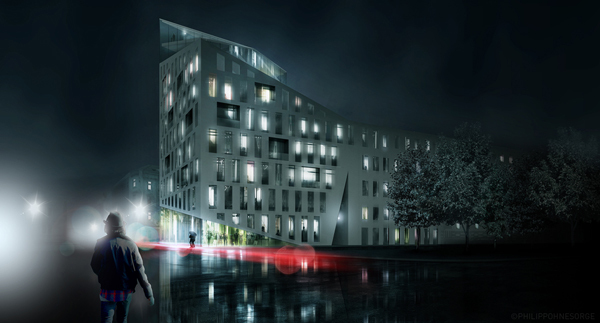 The project aims to be landmark for new impulses to urban development in Vienna. The mostly historical urban fabric of the city leaves little space for new urban developments in large scale. By creating intelligent designed buildings on important acupuncture points within the urban fabric we believe that discussions about new possibilities for redensifying the city can be triggered.